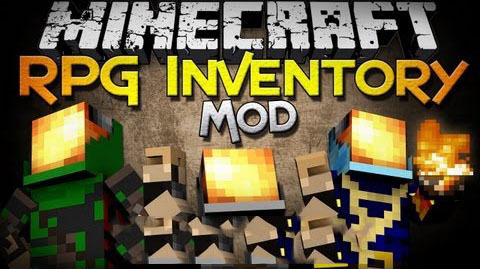 RPG Inventory mod which not only adds 6 brand new item slots that your Minecraft player can wear, but it also adds in three new classes you can join to learn magic and wield massive weapons! Open the Rpg Inventory with the ?End’ while being inside of the vanilla inventory ! To use a skill press ?F’ (or the key you apropriated in the ?Controls’ menu). Pressing the Skill key will cause all nearby enemies to be pulled towards you ? and thrown away to the opposite side. the farther away entities are, the further away they will get thrown. -Rage Breaker : Berserker’s can not stand losing ? Unleash your rage when health is below 2 hearts (or 2 hunger) ! The hammer will start glowing red, meaning that you are on a rampage and deal double damage ! Still full health ? The rage breaker has a massive KnockBack damage on mobs when you wear the full armor set ! -Right Clicking the Item? Is a mystery to most people. You should read ?Wizard’s Knwoledge : Volume 1 ? (included in this mod). Mages and Wizardry is not only about swinging your stick and casting spells. With magic comes great responsability and wisdom. If you can understand what is written in the book, you will are worthy to be called a mage !